I suppose it was all part of being an adolescent, but when I was fifteen I felt ill at ease in public, always believing that everyone’s eyes were on me, I blushed at the slightest thing and I was very easily embarrassed. And probably the most blush-filled, toe-curlingly embarrassing day that I would ever have to live through at that awkward age was the one I spent with Mum in Edinburgh. The trouble began with that suit; the one that Auntie Cathie bought for me. Auntie Cathie was Dad’s half-sister. Mum didn’t have much time for her and called her all sorts of names, like loud and uncouth and slovenly. I don’t think Auntie Cathie had much time for Mum either. Anyway, Auntie Cathie’s husband was killed in an accident at his work – he was hit by one of those enormous steel wrecking balls, which took his head clean off, apparently – and she received a big insurance pay-out as a result. Not long after the funeral, Auntie Cathie appeared in our house offering to take me into Edinburgh to buy me a present. The next thing I knew, Auntie Cathie and I were in a little tailor’s shop on Lothian Road, one that catered exclusively for “the young gentleman”, and I was trying on a suit. Since Auntie Cathie hadn’t seemed to bother about my welfare before, never having given me so much as a bean on my birthday or at Christmas, Mum may well have been correct about the flaunting. Whatever Auntie Cathie’s motive for buying it, though, the suit was a corker. Grey with a faint white pinstripe, it was a two-piece double-breasted affair, which came with a wide black belt, and it fitted my skinny frame perfectly. I loved that suit; so much so that it was hardly ever off my back. But Mum wasn’t about to let it go at that. Shortly after the suit purchase, she decided that she also would take me into Edinburgh for a “treat”. 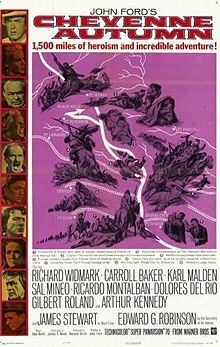 We would go to the cinema for an afternoon showing of John Ford’s latest film, Cheyenne Autumn, which had just been released in the UK. Since Mum and John Ford shared a sort of reciprocal love – he for her mother country, Eire, and she for the Irishness that permeated his work – I reckoned that the treat would be more for her than me, but I didn’t argue. It turned out that Mum had another reason for wanting to see that film. She had a deep interest in the plight of the Native Americans and the injustices they had suffered at the hands of the American Government. In fact, Mum had a deep interest in a whole catalogue of injustices. There were the injustices in her home country that had been perpetrated over hundreds of years by the British Army – “the English Army”, as she used to contemptuously describe it. The atrocities included the brutal quelling of the Easter Rising in 1916 and the depraved rampage of the Black and Tans a few years later. And, of course, injustices had been meted out big time by the same army during another, much earlier, rising in Scotland, her adopted country, when in 1746 the supporters of Bonnie Prince Charlie were butchered during and after the massacre at Culloden. As an ardent champion of the underdog, therefore, Mum was pretty keen to take in Ford’s purported elegy for the Native Americans. Well, now he is here at the head of the force. And he stopped the whole street with a wave of his hand. Well, I swear to God that Mum must have believed that she and young Peter O’Loughlin were related. To reach the cinema from the top of Lothian Road, we needed to cross a busy junction. Disregarding such trivial matters as traffic lights and pedestrian crossings, Mum simply stepped off the pavement, dragging me, protesting, behind her, and with a wave of her hand brought the traffic to a screeching halt. With horns blaring all around, I caught a passing glimpse of the driver of the double-decker bus that had stopped inches from us. In keeping with the mood of that fairytale song, he was grinning from ear to ear at the surreal vision of the smiling, pretty colleen with the long blue-black hair, who was strutting, straight-backed and stiletto-heeled, across the road. In the cinema, we sat in the stalls, only a few rows back from the screen. Within minutes, my attention was rapt in the film and my mortification at the incident outside was all but forgotten. I wasn’t to know, however, that embarrassment number two was simmering next to me, ready to erupt. The film reached that dramatic moment when in the dead of night the captive Cheyenne broke free from the reservation to begin the long and arduous trek back to their ancestral hunting grounds. As they streamed out of the stockade, rousing music crashing around them and the audience, Mum jumped to her feet, stuck out a proud chin and raised a defiant fist. “Up the Indians!” she bellowed in that unmistakeable brogue of hers. Suddenly, every eye in the cinema was on her. I could hear muttering behind us and a few hissed calls to keep quiet. She sat down, the muttering ceased and the film continued, but my enjoyment of it had been spoiled. During the remainder of the performance, I cringed down in my seat, away from Mum, pretending not to be with her. And all the time I was sure that my beetroot-red face was shining like a beacon in the dark of the cinema. Then, when it was time to go, embarrassment number three raised its ugly head – or bottom, as it turned out. I was literally stuck to my seat; not by a casually discarded piece of chewing gum, but by a whole wad that had been placed there deliberately and had spread right across the seat of my trousers. Red-faced once again, certain that everyone could see the enormous sticky patch on my behind, I had to endure an awkward walk all the way down Lothian Road to the West End and the bus home. Needless to say, Auntie Cathie’s suit didn’t last for much longer; no amount of ironing with brown paper would remove the mess from the trousers. But what did endure from that day was a concern for the plight of the underdog that I inherited from Mum. Years later, I visited Kilmainham Gaol in Dublin to stand and weep on the spot where the English Army – sorry, the British Army – murdered Pearse and Plunkett and Connolly and ould Tom Clarke and many others after the Easter Rising. I wept also when I stood on a windswept Culloden Moor, certain that I could hear the dead souls of the clansmen butchered by Cumberland and his troops. Oh, and Dee Brown’s Bury My Heart at Wounded Knee has a permanent place on my bookshelf, a reminder of another massacre in another place. Every time I set eyes on the book, I think of Mum and I smile. “Up the Indians,” I whisper.